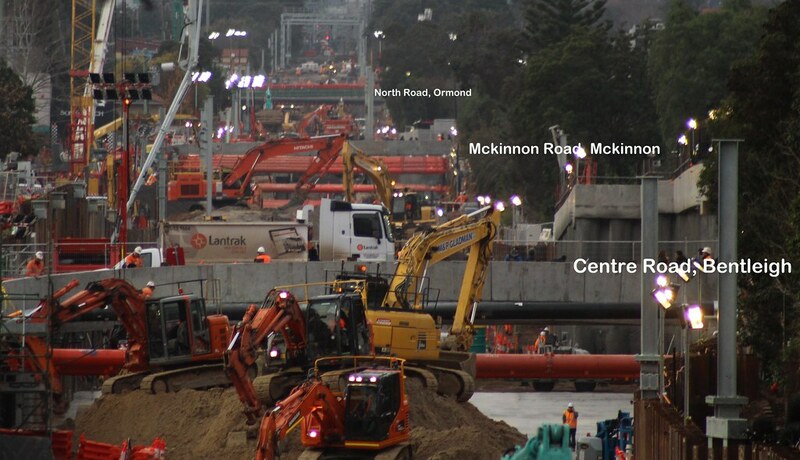 While we endure the train replacement buses, work is moving along on the Bentleigh-Mckinnon-Ormond trench. 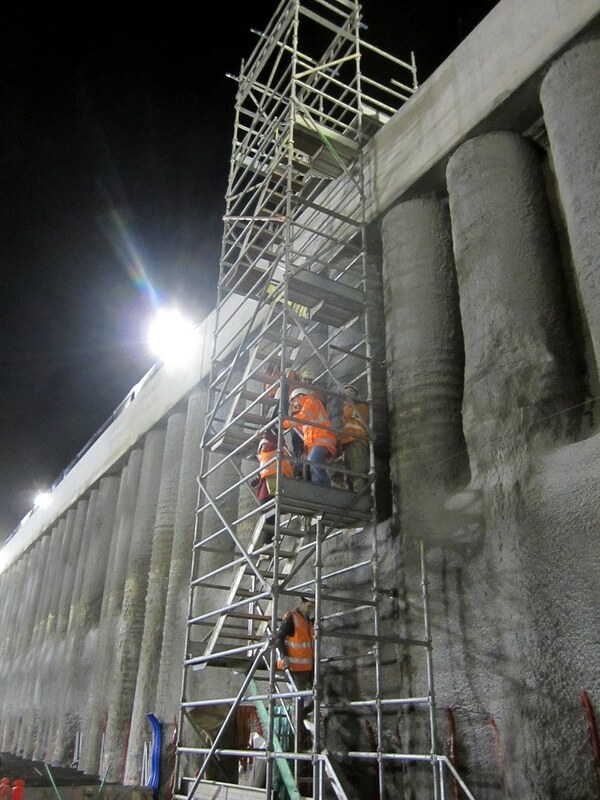 Works are continuing 24 hours a day. Most of the digging has been completed, and works in the trench itself are proceeding at the three station sites. 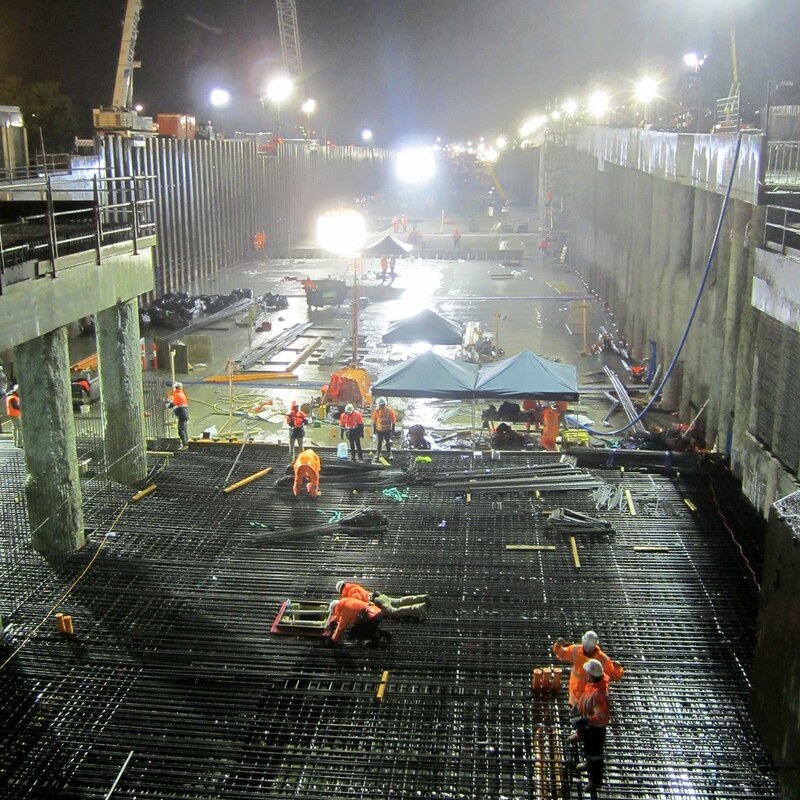 First a base level of concrete goes in, a working surface, then a thicker layer is added, in part to weigh down and seal the station, as the new Bentleigh station will be below the water table (the same applies at Mckinnon; Ormond is above the water table). But if you think it’s impressive from street level, it’s just amazing inside it. 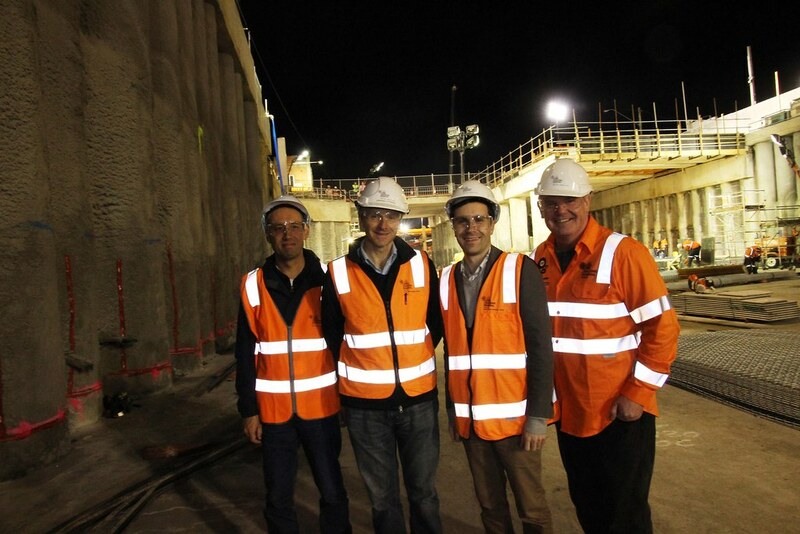 Thanks to the Level Crossing Removal Authority and local MP Nick Staikos I was lucky enough to take a look inside the trench on Thursday night. Once wearing PPE (Personal Protective Equipment), to get down there you take one of these stairwells. On the bottom of the trench you get a perspective completely different to what you see at street level. It’s amazing to think that just a couple of weeks ago trains were passing through here at ground level. 800-1000 workers are on the job at any one time doing various tasks, and I was amazed at the level of co-ordination that must go into it. 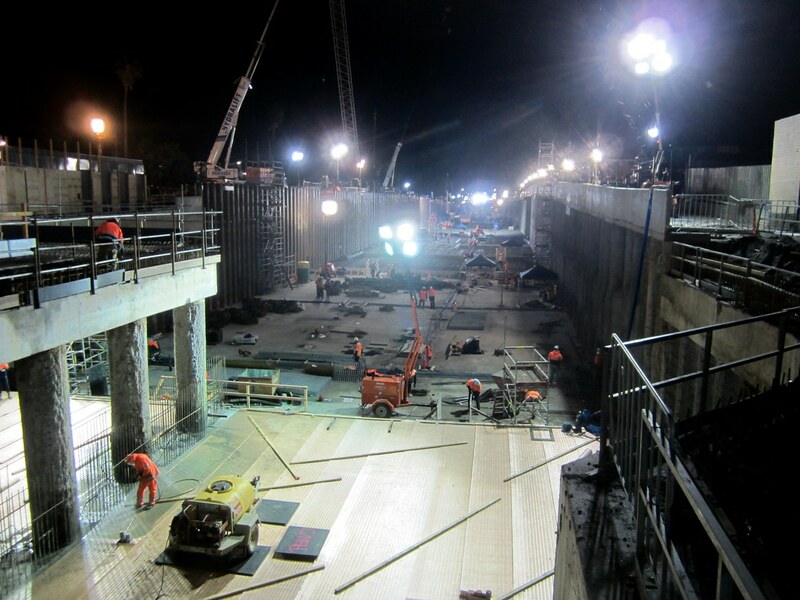 On top of the thick layer of concrete, ballast and track and platforms will be built. The ballast is apparently being sourced from Deer Park. The supplier is likely to be pretty busy over the next few years with all the level crossing removals going ahead (though ballast won’t be used on the Dandenong line). It’s a reminder that there’s a huge supply chain feeding these projects. Whatdayamean it’s a month until the next train?! The rain this week has apparently slowed down the project a little bit, but overall it’s still going well. 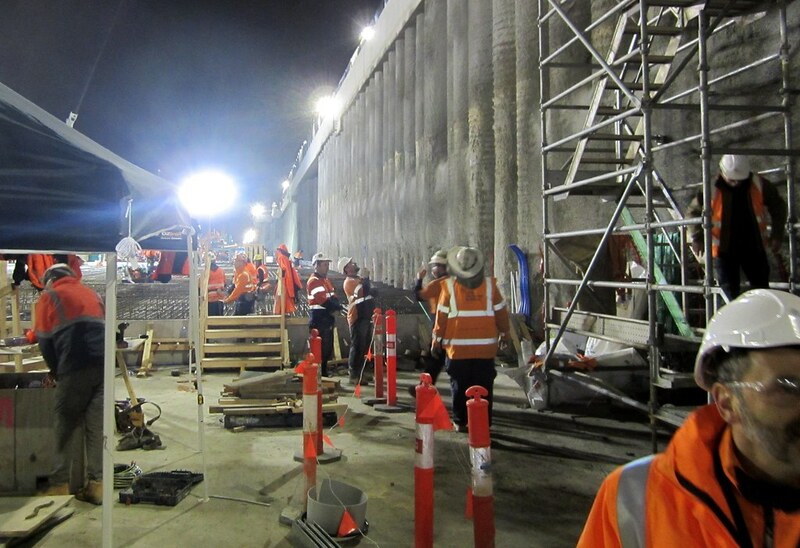 Construction of the platform at Ormond has commenced, as well as laying of track at the Glenhuntly end. Naturally we had to pose for a happy snap. I’m not a construction geek, but it’s all incredibly impressive. I’m told over the 37 days of the big shut down, they will spend $100 million. The buses this week have been mostly smooth, though there have been some hiccups… it’ll be good when it’s finished. 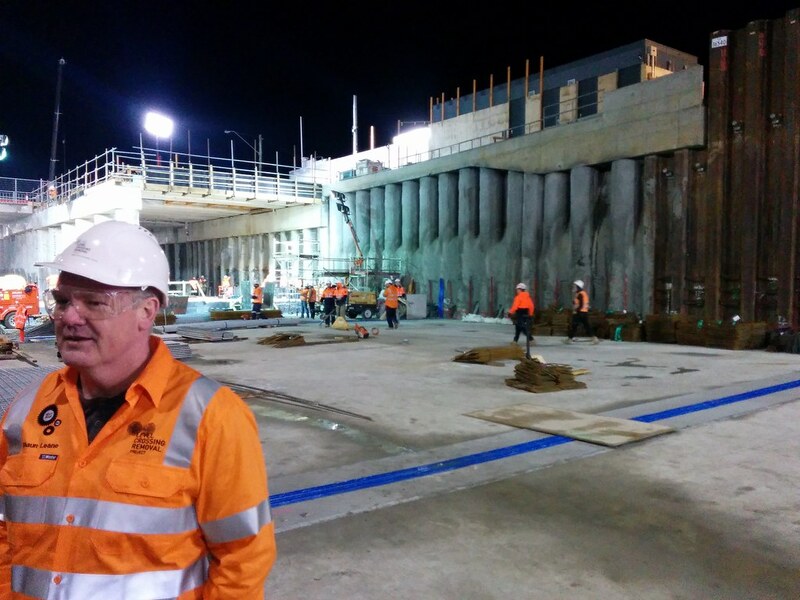 The LXRA has posted timelapse videos of the past week from Bentleigh, Mckinnon and Ormond. A “cash mob” has been organised to support Bentleigh traders suffering revenue shortfalls during the project: Channel 9 story; Moorabbin Leader story. What ever happened to the term cutting? That is the proper railway term for what is being built here. I had an interesting bustitute experience during the week where the bus was not going to stop to pick me up despite standing under the blue tent and the driver became a bit mouthy when I took action to get their attention. When people say bustitution ‘only adds x minutes’ to your journey, get over it etc., they’re ignoring the additional uncertainties that can make a single trip stressful, let alone if you have to do it twice a day with multiple connections. Glad the CD9 will involve minimal bustitution. Great pictures. You captured the scale very well. With schools going back this week it will be a real test for the system (strain on replacement buses, commuters using other train lines, such as Sandringham). I hope they’re making one of those ‘Megastructure’ type TV documentaries about this project. The LXRA’s social media channels show 2 minute snippets but I’d like to go deeper and see what happens behind the scenes to plan and execute such a massive undertaking. It looks like a big, ugly hole in the ground to me. It keeps the suburbs cut in half, in a worse way than the existing line. I live in Armadale and have to experience a big, ugly hole in the ground and a bisected suburb. Skyrail would be a much better option. What a waste of work and money, having to dig out all that soil and waterproof the cutting with thick concrete. I hope they use an elevated option at all other removals where possible. 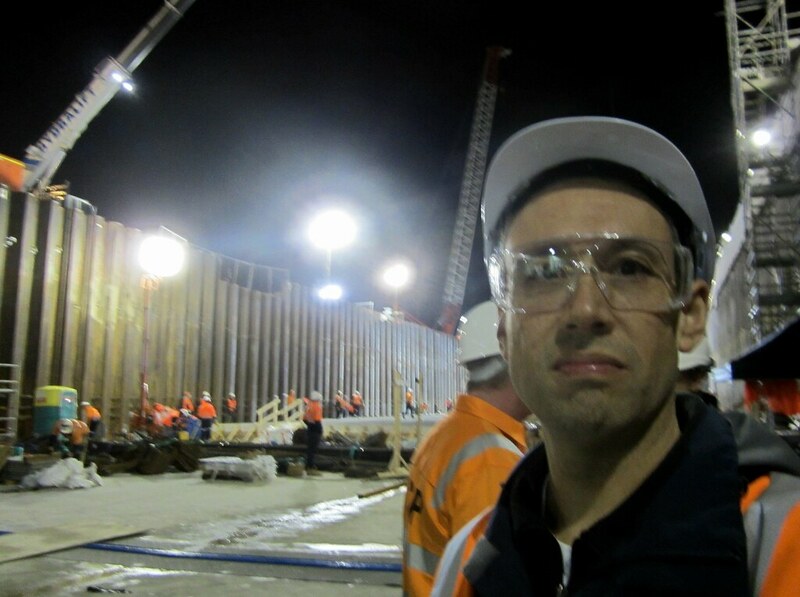 Whilst I find it interesting seeing how they build such things, I agree 100% that the trench creates a far bigger barrier to the sides of the suburb than any other option. I get a headache whenever I see a “no sky rail” pamphlet arguing that elevated rail will divide their community and that they want a trench instead.